By Michael Sebastian . Published on November 26, 2014. An in-depth New York Times report last weekend looked at the downside of North Dakota's oil boom, and cast energy companies in a poor light -- except for one called Statoil, which is actually called out for its impressive safety record. In the story's mobile version, a display ad for Statoil appeared just a few paragraphs from where the company is approvingly mentioned. Was this an egregious breach of the Times' famous wall between advertising and editorial? No, but it highlights the occasional shortcomings of selling ads through automated auctions. The Times declined Ad Age's interview request, but a spokeswoman said in an email that the ad was served via automated ad technology and that its appearance in the article was a coincidence. "We diligently track ad delivery through our programmatic channels," the spokeswoman said. "Though it is difficult to proactively filter out all questionable ads, we continually block advertisers and ad creatives that, we believe, are below standard for our quality of content or simply a mismatch for our stories." The ad here was less a mismatch than too good a fit, one that could make readers wonder about editorial independence. "We worked with our programmatic provider to remove the ad from this particular article as quickly as possible," the spokeswoman added. Here's what all of that means. Companies can buy certain ad space on the Times through automated ad-buying platforms, referred to broadly as programmatic technology. Once the story is live, the Times opens unsold ad inventory to ad networks such as Google AdWords, which wound up serving the Statoil ad. Statoil did not respond to Ad Age's emails. Statoil or its media-buying agency likely used Google AdWords to bid on ad space in articles with certain keywords, according to Matt Prohaska, CEO and principal at Prohaska Consulting, whose company advises marketers on programmatic tech and other strategies. One keyword might be the company's name, although that's not usually the case because most brands want to avoid risking an adjacency to a negative article or review, Mr. Prohaska said. Statoil could also have placed bids on keywords such as "oil," "energy" or even "North Dakota," banking on its safety record in the state to protect it from bad press, he added. Statoil has run programmatic ads on the Times' desktop and mobile sites, but it's not clear whether its ad definitely appeared in the desktop presentation of "The Downside of the Boom." Statoil ads have appeared on nearly 500 publishers' sites this year, with significantly more in November than October, according to an analysis by digital analytics firm Moat. 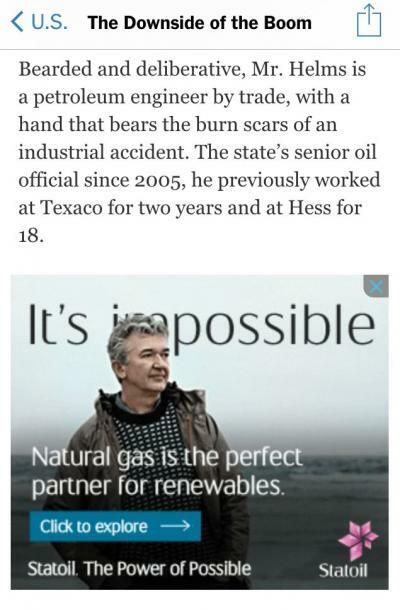 Statoil's ads have also shown up on the websites of Time, CNN, Wired, The New Yorker and Slate. Except when selling their ad space directly, publishers have few effective tactics to completely prevent awkward adjacencies. "There are ways to block categories or advertisers, but you have to do it within a whole section or site," Mr. Prohaska said. "There isn't an automated way to say, 'Hey, if there's something positive there, it shouldn't be there because it won't look right.' So sometimes things slip past the goalie." 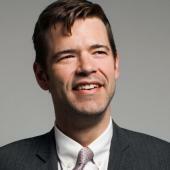 Mr. Prohaska previously served as the Times' first-ever programmatic advertising director, a role he held until February when the position was eliminated. Times executives have said the company is building its own automated ad-selling technology and expects sales from these channels to become a bigger part of its business. Digital ad revenue at the Times climbed 16.5% in the third quarter, but total ad revenue declined 0.1% to $137.9 million as print advertising slumped.